This topic has drawn the attention of much of the public: About two-thirds of Americans (66%) have heard about social media bots, though far fewer (16%) have heard a lot about these accounts. 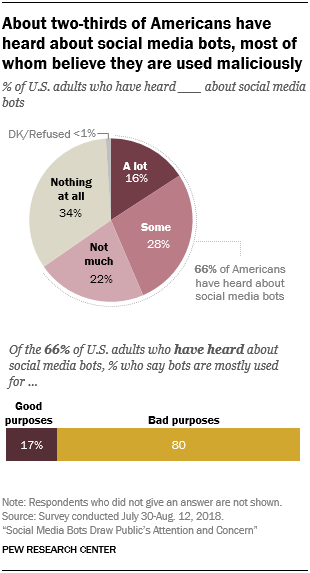 Among those aware of the phenomenon, a large majority are concerned that bot accounts are being used maliciously, according to a new Pew Research Center survey conducted July 30-Aug. 12, 2018, among 4,581 U.S. adults who are members of Pew Research Center’s nationally representative American Trends Panel (the Center has previously studied bots on Twitter and the news sites to which they link). Eight-in-ten of those who have heard of bots say that these accounts are mostly used for bad purposes, while just 17% say they are mostly used for good purposes. To further understand some of the nuances of the public’s views of social media bots, the remainder of this study explores attitudes among those Americans who have heard about them (about a third – 34% – have not heard anything about them). While many Americans are aware of the existence of social media bots, fewer are confident they can identify them. About half of those who have heard about bots (47%) are very or somewhat confident they can recognize these accounts on social media, with just 7% saying they are very confident. In contrast, 84% of Americans expressed confidence in their ability to recognize made-up news in an earlier study. When it comes to the news environment specifically, many find social media bots’ presence pervasive and concerning. About eight-in-ten of those who have heard of bots (81%) think that at least a fair amount of the news people get from social media comes from these accounts, including 17% who think a great deal comes from bots. And about two-thirds (66%) think that social media bots have a mostly negative effect on how well-informed Americans are about current events, while far fewer (11%) believe they have a mostly positive effect. While the public’s overall impression of social media bots is negative, they have more nuanced views about specific uses of these accounts – with some uses receiving overwhelming support or opposition. For example, 78% of those who have heard about bots support the government using them to post emergency updates, the most popular function of the nine asked about in the survey. In contrast, these Americans are overwhelmingly opposed to the use of bots to post made-up news or false information (92%). 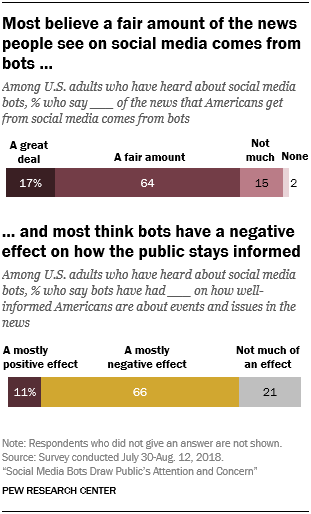 They are also largely opposed to bots being used for political purposes and are more split when considering how companies and news organizations often use bots.